This exercise is effective in injury prevention and rehab programs for those with ankle instability, anterior knee pain, hip weakness, poor landing mechanics and higher ACL risk if playing pivoting and cutting sports. It will improve core stability, hip and knee strength/stability, dynamic balance, groin flexibility and trunk control. The band serves to enhance activation of the hip external rotators and further challenge stability of the hip and knee. The band should not pull too forcefully, but just enough to cue the desired muscle activation pattern. A slower cadence on the eccentric portion of the exercise is preferable to maximize stability and strength gains. Do not force through any painful ranges of motion, and remember that form and alignment are paramount so limit the reaching based on the client’s ability to maintain adequate control. Facilitating better lower leg stability is always a priority in my rehab and training programs. I have long been an advocate of single leg training to resolve asymmetry and reduce compensations and injury risk. Once a client masters form on the ground, adding in more proprioceptive challenges can take their training to a new level. Today I wanted to share a previously unpublished video I shot for my ‘Functionally Fit’ column that demonstrates a single leg squat exercise on the BOSU Elite Trainer. It is a relatively new exercise tool that offers some tweaks on the original BOSU balance trainer. 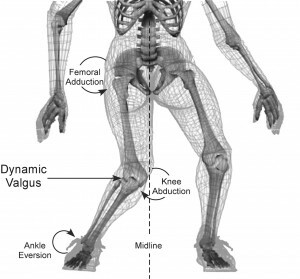 It is widely accepted that decreased hip strength and stability leads to knee valgus. Excessive frontal plane motion and valgus torque increase the risk for non-contact ACL injuries. While we know that hip abductor weakness is more of an issue in females than males, the question remains to what degree other factors are involved. Claiborne et al (1) noted that only 22% of knee variability could be linked solely to hip muscles surrounding the hip. In light of this we must look at the whole kinetic chain when assessing movement dysfunction and injury risk. In the most recent issue of the IJSPT, researchers sought to discover how activating the core during a single leg squat would impact the kinematics of 14 female college-age women. They excluded participants with current pain or injury to the lower extremities or torso, or if they had a history of any lower extremity injuries or surgeries in the past 12 months. The participants were assessed for their capacity to recruit core stabilizer muscles using lower abdominal strength assessment as described by Sahrman (2). This testing model has 5 levels of increasing difficulty used to challenge participants to maintain a neutral spine. The draw back of this method is that it is done in supine versus the standing position of this study, but the author acknowledges this limitation. Out of a possible high score of 5, five of the participants scored a 1 or 2, while the other nine scored a zero. How do we use this information to affect our practice? Well, in terms of rehab it seems straightforward and many of us may already encourage patients to activate their core during treatment. However, I think the greater contribution may come in injury prevention programs (particularly ACL programs) where we are looking at all facets of neuromuscular control and appropriate muscle activation patterns. With any prehab or rehab strategy, we as clinicians, trainers and strength coaches are essentially trying to reprogram the brain to summon and execute a better motor pattern or strategy – feedforward training. We know that healthy individuals tend to have better transverse abdominus and multifidus muscle activation, so it only makes sense to consider activation of local stabilizers as we work on global muscles. Improving core and pelvic stability should only help reduce unwanted frontal plane motion. With that said, the authors of this study readily acknowledge more work needs to be done with larger clinical populations (including EMG work) to more clearly identify what magnitude the core musculature has on lower extremity motion and displacement. Keep in mind the proper program will always stem from your ability to assess movement impairment and tissue dysfunction. I suggest beginning with a FMS in the athletic population and incorporating parts of that or the SFMA to compliment your evaluation in the clinic. This will generally reveal the priorities for the corrective exercises. For now, we can use this information in this particular study to be more intentional with our patients and clients suffering knee and hip dysfunction by adding this one simple step to our programming. 1. Claiborne TL, Armstrong CW, Gandhi V, Princivero DM. Relationship between hip and knee strength and knee valgus during a single leg squat. Journal of applied biomechanics. 2006;22(1):41. 2. Faries MD, Greenwood M. Core training: stabilizing the confusion. Strength & Conditioning Journal. 2007 ;29(2):10.